With a clean and simple look reflecting the DIY ethos of the era, the illustration of Milo by classmate Jeff Atkinson quickly became an icon of punk culture and was re-interpreted by other artists on almost every future Descendents record (not to mention the many fan tattoos). And just as with this iconic image, “Descendents” continued to be set in Franklin Gothic Extra Condensed for a nice continuity to the band’s visual identity. Originally by Morris Fuller Benton in 1902, this version is likely from the ITC family that Victor Caruso drew in 1980. Old style or humanist typefaces date back to 1465, and are characterized by a diagonal stress (the thinnest parts of letters are at an angle rather than at the top and bottom), subtle differences between thick and thin lines (low line contrast), and excellent readability. Old style typefaces are reminiscent of the humanist calligraphy from which their forms were derived. An old style font normally has a left-inclining curve axis with weight stress at about 8 and 2 o’clock; serifs are almost always bracketed; head serifs are often angled. As evident by another recent post, Franklin Gothic may turn out to be one of the most widely-used punk fonts of the 80s. We’ll just have to wait and see on that one. Great reference. One of my all-time favorite albums that summed up the geek/teen angst of the eighties that I felt such kindred emotions with. 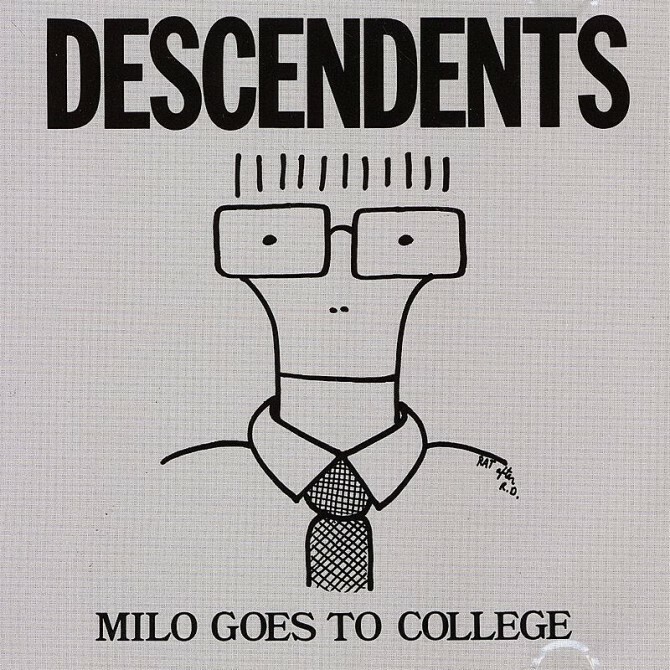 That album, on tape, roared thru the speakers of my high school car countless times, lending the positive spin the Descendents always delivered to the most debilitating teen angsts, heartache, belonging, parents and school. You rock for using them as an example.